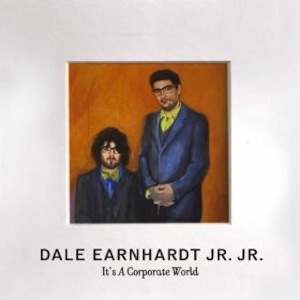 ALBUM REVIEW: “It’s A Corporate World” by Dale Earnhardt Jr. Jr. Here is a situation hopefully someone other than me has had in the history of music critiques. Before I even sat down to listen to Dale Earnhardt Jr. Jr.’s debut, I already choreographed in my mind how the experience was going to happen. I’d listened to snippets here and there, glaze over nibbles in the press about their SXSW shows, and pretty much have my quick conclusion. However, as the album sank in, I learned that the devil is in the details and that the devil is one persuasive son of a gun. It’s A Corporate World is an eclectic mix of Tropicana, baroque, electro-pop and just enough Paul McCartney melody to make you wonder how they managed to pull out a rainbow of influences from seemingly dark and unmovable places. Finding the music’s richness as intriguing and perfectly executed as it is, I didn’t fully expect to be engaged with the duo’s lyrics as it happened. “It’s a Corporate World” finds this Detroit duo examining the expanding corporatization in America and as a result, the biggest losers. “We Almost Lost Detroit,” set to a beat busting, Prince-like powerhouse riff, parlays the Michigan city’s recent struggles through descriptive imagery and an emotional first hand account of their beloved hometown. It’s A Corporate World has something for everyone. The album is easily one of the most inviting, sincere and mood altering experiences of 2011.